Leila M. provides a great selection of alternative, dance and electronic music. There is also a fine selection of DVD’s, bags and changing exhibitions. 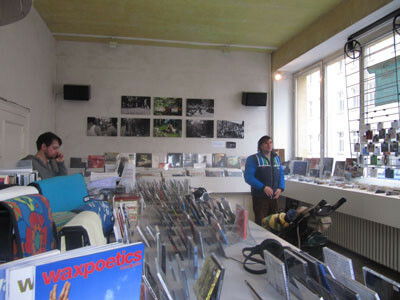 This shop belongs to the “musicberlin” network, which has a huge stock of vinyl available online. in a beautiful sunny saturday, the man at the phone in the picture, who opened the shop 20 minutes late, maybe disappointed by working instead of sunbathing, was very unpleasant, didn’t give a smile, either an help, just suggesting to relate myself directly to the website, while he preferred relate himself with a postman, to whom expressed all his boring situation leaving his eyes to the ceiling..